Outlaws Run Wild in Coyote Gulch! Sheriff Jackson MURDERED by “Little Warriors” gang! Sheriff Jackson MURDERED by "Little Warriors" gang! Coyote Gulch, Texas -- There was panic in the streets as unknown band of outlaws shot their way into the bank and made off with the Silverado Mining Company’s payroll! When the smoke cleared, Sheriff Pettigrew Jackson lay dead in the street and Mr. Upton, the banker, had barely escaped with his life! This year’s Summer Campaign will run between 5-7 weeks at Little Wars. As with previous campaigns, the action centers on a gang of outlaws trying to make a name for themselves in the Wild West. This year’s game features two “younger guns,” Diego Duran and Ian Kristensen. Diego is a new gun, but Ian is an “old hand” at Gutshot, having also played the infamous, blood-thirsty character, Big Jack, in the Summer Campaign back in 2003. Other players this year include Diego’s father, Dion, Rupter Cullen, and Zack Wells. Game co-creator Mike Murphy is also on hand to aid in the mayhem. Each player is running an outlaw who, if he survives, will advance from a wet-behind-the-ears punk into a feared outlaw. And, hopefully, he’ll make a lot of loot on the way. 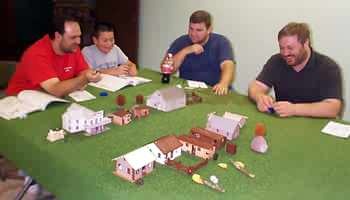 “In addition to having fun, this gang is also helping us playtest one of our upcoming books, Gutshot: Adventures on the Outlaw Trail,” Mitchell explained. This Outlaw Trail book will be a campaign setting that will include detailed maps for the towns and cities, as well as adventures, NPCs, and all the details needed to run an ongoing campaign in the wild and wooly West. The Little Warriors (named in honor of the Little Wars store which is kind enough to provide us with AC on these hot summer nights) consider the best way to plan an unathorized withdrawl from the bank. (Left to right) Dion Duran, Diego Duran, Zack Wells, and Rupert Cullen. There is no solid release date for the book, yet, but Mitchell said he hopes to have a rough draft of portions of it ready by the end of the year and added that he plans to post chapters online for feedback and playtesting.